It's hard to beat the softness of environmentally-friendly organic merino wool, so it's no surprise that this beautiful fiber is a popular choice for eco-conscious baby and children's clothing. The renewable and sustainable resource makes exquisite wool socks, hats, sweaters, sleepers, and more, especially when it's processed without chemicals or harsh dyes. According to the Organic Trade Association, in order for the wool to be certified organic, growers must provide only organic feed for their sheep. They also can't dip sheep in a pesticide solution to prevent parasites, and they can't process wool with harmful chemicals. These factors mean that when you put an organic wool sweater on your little one, you can feel confident that it hasn't been contaminated with toxins and that it's been produced in a way that is good for the planet. There are several companies that specialize in organic wool kids' clothing. Offering everything from sleepwear for newborns to adorable hoodies for older kids, Nui Organics has a great selection of organic wool products. Sizing runs from newborn all the way to size six, and prices are reasonable. A sweet footed bodysuit for the littlest babies retails for about $78, while a charming sweater for kids runs about $71. You'll also find accessories, footwear, and blankets in a range of styles and colors. Nature Baby, a store with a range of organic children's products, has an extensive selection of merino wool clothing for newborns through four-year-olds. From the Natural Merino Essentials Sleeping Gown for $75 to the Kids' Essential Tee, (around $45), you'll have no trouble finding something to keep the smallest members of your family warm and cozy in any weather. Although not all of the organic wool products at Little Spruce Organics are crafted from merino wool, there are plenty of merino clothing items for babies and toddlers. For instance, the Disana Organic Merino Wool Knitted Melange Cardigan, priced at $55, will keep older babies toasty in cool weather. Many items, like the Engel Organic Merino Wool Long Sleeved Shirt, available for about $25, are also competitively priced. 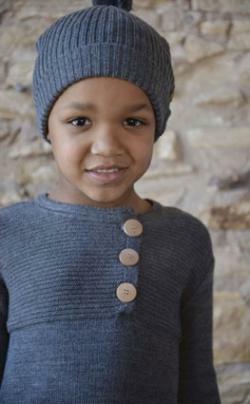 Urban-Merino has a full line of clothing items for children, all crafted out of organic merino wool. This is a great place to look for that perfect dress or sweater for an older child. The sweet Frill Dress, priced at $107, is a good choice for a toddler or school-aged girl, while the $84 Raglan Top is a great layering piece for older boys. If you're looking for organic merino sweaters and accessories for pre-teens and older children, Green Mountain Organics is a good shopping resource. From the Ruskovilla Organic Merino Wool Long Sleeved Shirt for about $45 to the Short Sleeved Shirt for about $35, everything is also reasonably priced. It's important to note that many of these products are sized according to the child's height in centimeters. Another great source for organic merino products for all ages is Amazon.com. With items from a number of manufactures, you're sure to find the perfect item for your child or baby. From the adorable LANACare Organic Merino Wool Baby Sweater for about $60 to the Children's Organic Merino Wool Bed Socks for $55, there are plenty of items to choose from. Featuring organic merino wool items from several brands, Urth Child has clothing for babies and kids up to ten years old. The super cute Organic Merino Wool Straight Leg Pants, priced at $36, is perfect for babies on the go, while the $36 Organic Merino Wool Leggings make a great base layer under jeans and snow pants. For orders over $75, Urth Child offers free shipping. Specializing in organic merino wool and silk undergarments for kids of all ages, Flowering Child is a great place to find warm, cozy underthings for the kids in your family. The Hocosa Wool-Silk Sleeveless Undershirt retails for about $19 and is sized from 18 months to 12 years. Another great option is the Disana Merino Wool Leggings for babies, priced at $25. No matter which clothing item you choose for your child, you'll know that organic merino wool will keep him or her warm and comfortable. In addition, the sustainable growing practices used to make merino wool are great for the earth and your little one.